The outlook for Philippine Airlines (PAL) remains relatively bleak following a strategy shift which has resulted in the group exiting the budget end of the market. Transitioning low-cost sister carrier AirPhil Express into full-service regional carrier PAL Express may succeed at improving the group’s short-term financials but at the expense of growth and market share. The PAL Group will likely see its share of the Philippines domestic passenger market slip to less than 35% in 2013, compared to 42% in 2012. The shift in strategy, which leaves PAL focusing entirely on the much smaller but less competitive top end of the Philippine market, follows the Apr-2012 ownership change at PAL and AirPhil. The new majority owner of both carriers, the San Miguel Group, has brought new life into the group, providing a badly needed recapitalisation which is being used to pursue fleet renewal and growth of its long-haul network. But in the domestic and short-haul international markets PAL is suffering and the prospects are not bright given some of the decisions made by San Miguel during its first year running the PAL Group. PAL has struggled to find an appropriate niche since it first faced bankruptcy in the late 1970s. Recent years have seen little improvement and its parent company reported another loss for the quarter and nine months ending 31-Dec-2012. PAL Holdings posted a net loss of PHP2.62 billion (USD64 million) for the quarter, an 80% increase compared to the PHP1.45 billion (USD36 million) for the same three months of 2012. For the nine month period, PAL Holdings reported a 24% reduction in losses from PHP3.6 billion (USD88 million) in 2011 to PHP2.74 billion (USD67 million) in 2012 (see background information). PAL Holdings includes Philippine Airlines and subsidiary companies but does not include AirPhil/PAL Express, which is part of a separate sister holding company. Passenger revenues at PAL were down slightly in the last three months of 2012 and were up for the nine month period by 2% to PHP46.1 billion (USD1.1 billion). PAL saw its domestic passenger traffic decrease by 5% in the calendar year 2012 to 4.1 million while international passenger traffic increased by 1% to just under four million, according to Philippine CAB data. PAL's recent performance and outlook in the international market will be examined in the next part of this series of articles on Philippine carriers. Domestically PAL has struggled to compete against fast-growing LCCs, which are generally better positioned to serve the Philippine market given that most passengers in the country are extremely price conscious. PAL has seen its domestic traffic drop by 32% over the last three years from just over six million passengers in 2009. During this period, PAL has seen its share of the domestic market slip from 41% in 2009 to only 20% in 2012, according to Philippine CAB data. Back in 2006, PAL had a market leading 45% share of the Philippine domestic market. Then LCC Cebu Pacific overtook PAL to become the largest domestic carrier in the Philippines back in 2007 and its market share has grown from 36% in 2006 to 46% in 2012. PAL’s initial response to Cebu’s rapid rise was to transition Air Philippines to an LCC, a model the PAL sister carrier adopted in early 2010 as it was rebranded AirPhil Express. AirPhil expanded rapidly over the subsequent three years, adding 13 A320s while retaining nine Bombardier Dash 8 turboprops for regional routes. The carrier transported nearly 4.5 million passengers in 2012, surpassing for the first time the number of passengers at PAL mainline – testament to the relative strength of the budget end of the market. Back in 2009, the last year it was still known as Air Philippines and followed the FSC model, the carrier had transported only 409,000 domestic passengers. The budget brand strategy seemed to work as it allowed PAL’s owners to mitigate the loss of market share to Cebu Pacific. AirPhil also gave PAL a response as three other LCCs entered the domestic market – Zest in 2008, followed by SEAir and AirAsia Philippines in 2012. (Zest was originally known as Asian Spirit, which followed a full-service regional model until rebranding and adopting the LCC model following an ownership change in 2008. SEAir also operated domestically as a regional full-service carrier until it became an affiliate of Tiger Airways in 2Q2012 and launched an LCC operation on domestic trunk routes while AirAsia Philippines was an entirely new entrant, launching services in Mar-2012). PAL and AirPhil combined accounted for 41.5% of the Philippine domestic passenger market in 2012, compared to 46.1% for market leader Cebu, 10% for Zest, 1.5% for SEAir and 0.8% for AirAsia Philippines. While PAL and Air Philippines combined accounted for 51.8% of the market back in 2008, the loss of market would have been much stiffer if it were not for the decision to enter the budget market with AirPhil. Over the last three years the PAL/AirPhil combination only saw its market share drop slightly from 43.2% in 2010 and 42.7% in 2011. After San Miguel took over one year ago from prominent businessman Lucio Tan as the majority and controlling owner of PAL and AirPhil (Lucio Tan continues to own large minority stakes in both carriers), it seemed the two-brand strategy that was initiated in 2010 would continue. Initially PAL’s new management team, led by San Miguel boss Ramon Ang, was looking at pursuing more rapid expansion of the AirPhil budget brand with more A320s as well as A330s sourced from PAL’s newly increased order book with Airbus. San Miguel, however, gradually adjusted the group’s two-brand strategy during the second half of 2012. The first phase of this adjustment came at the end of Oct-2012, when AirPhil stopped serving seven domestic trunk routes and took over from PAL services on six smaller domestic routes. The change left only one brand on virtually all domestic routes, with AirPhil being relegated to smaller generally unprofitable markets. PAL currently serves nine domestic destinations while PAL Express serves 30 domestic destinations, according to Innovata data. PAL Express’ largest remaining routes are predominately to major leisure destinations such as Caticlan, Kalibo and Puerto Princesa while PAL is now the only brand linking Manila with other major cities such as Cebu and Davao. Previously PAL and AirPhil operated side by side on major domestic trunk routes, following a typical two-brand FSC/LCC strategy which in theory involves the FSC focusing on connecting and higher-yielding point-to-point passengers while the LCC focuses on price conscious point-to-point passengers. Most significantly, the rebranding came with a shift in the operating model, returning the carrier back to its full-service roots. PAL Express is now offering passengers complimentary snacks, drinks and newspapers as well as frequent flyer miles in the PAL programme. The two carriers are now striving to provide the same service standards at all touch points, providing a seamless product. Following a Cathay/SIA group model? Mr Ang says that while PAL Express is now a full-service carrier it will continue to be an “LCC in terms of managing cost”. Maintaining a lower cost structure than PAL is critical given most of PAL Express’ routes were historically unprofitable when operated by PAL. But with its frills, PAL Express can hardly be still considered an LCC. The carrier is now following more a regional full-service carrier model, similar to the model used by Singapore Airlines (SIA) subsidiary SilkAir and Cathay Pacific subsidiary Dragonair. It is also the model used by Thai Airways unit Thai Smile, which was initially envisioned as a hybrid low-cost regional carrier but has evolved to become more like a full-service regional than an LCC. SilkAir and Dragonair each have significantly lower cost structures than their parents, making them more viable options for thinner regional routes including markets with intense LCC competition. But they offer a full service product in all respects and focus on making sure a seamless product is provided to passengers connecting from flights operated by the parent brand. PAL Express has a similar proposition. While having a lower-cost – but not low-cost – regional subsidiary is logical for the thinner routes, PAL now finds itself without a play in the budget market. Ignoring the lower end of the market is risky as it goes against the common multi-brand strategy among Southeast Asian airline groups. SIA, Thai Airways, Garuda Indonesia and Vietnam Airlines all currently have budget airline subsidiaries or affiliates. Among other major Southeast Asian flag carriers, only Malaysia Airlines (MAS) also currently lacks a budget subsidiary, a seemingly flawed strategy that new Lion subsidiary Malindo is now exploiting. MAS did temporarily have an LCC operation under the Firefly brand until late 2011, when it made a similar U-turn to PAL. But the circumstances at MAS were different in that the U-turn was prompted by a partnership and equity swap with AirAsia, which was however later unbundled. There were no such external pressures behind PAL’s U-turn. The new management team, following recommendations from an outside consultancy, concluded that AirPhil was largely cannibalising PAL and taking away PAL passengers rather than effectively competing against Cebu Pacific and other LCCs. But this could have been fixed with changes at AirPhil rather than dropping the concept of a budget brand entirely. While PAL saw its passenger figures drop as AirPhil expanded, the rate of growth of AirPhil more than offset the PAL losses, indicating that AirPhil was also picking up passengers from other LCC and/or stimulating demand on its own. AirPhil’s annual domestic passenger numbers grew by four million from 2008 to 2012 while PAL’s figures dropped by half of that, or two million passengers. While PAL is now picking up some of the passengers previously carried by AirPhil on domestic trunk routes, it has also lost a large chunk of passengers to competitors. PAL has generally increased capacity on the seven domestic trunk routes that AirPhil also used to operate. 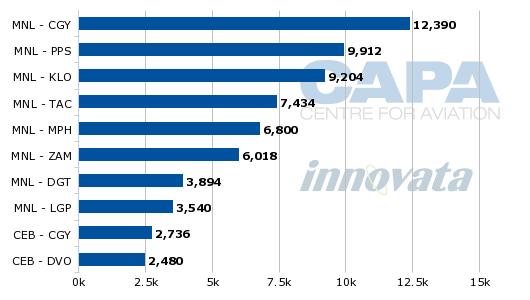 But the capacity increases have not been enough to completely offset the reductions in capacity from AirPhil. 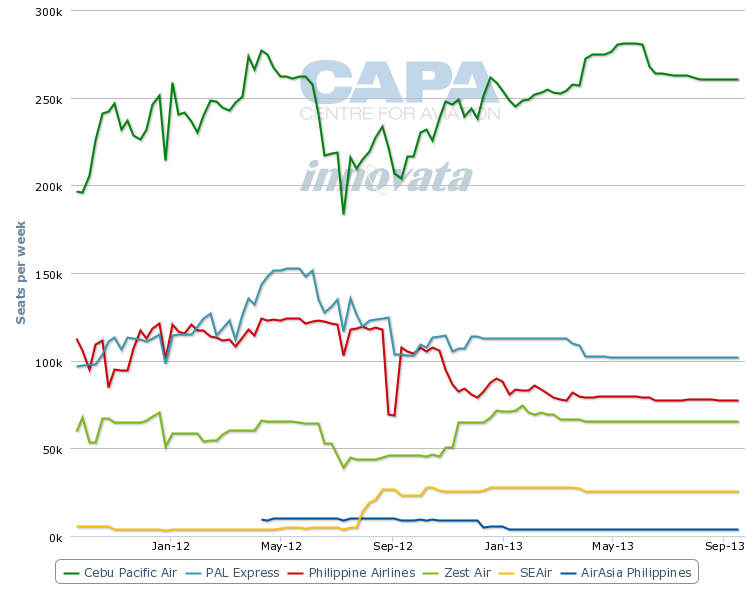 According to CAPA and Innovata data, PAL’s domestic seat capacity is currently down about 36% compared to Apr-2012 while domestic capacity at PAL Express/AirPhil is down about 29% over the same period. As a result the two carriers combined now have only a 33% share of seat capacity in the Philippine domestic market, compared to 43% one year ago. Given the current capacity levels, the PAL Group could see its market share drop by as much as 10ppt from the 41.5% share it captured in 2011. Cebu Pacific will be the main beneficiary although smaller LCCs Zest and SEAir will also see their shares increase. AirAsia Philippines is now focused almost entirely on the international market but will benefit indirectly through its new strategic partnership with Zest. Cebu Pacific currently accounts for 50% of capacity in the Philippine domestic market, compared to about 43% a year ago. Zest currently has a 12% share of capacity, up from about 11% a year ago, while SEAir has seen its share increase from less than 1% to almost 5%. Cebu, which was able to capture a 46% share of passengers in 2012 as it had the highest load factor among Philippine carriers, should see its share of the Philippine domestic market exceed 50% for the first time in 2013. Cebu’s domestic load factor in 2012 was 77%, compared to 72% for PAL and 71% for AirPhil. The domestic market share ceded by the PAL Group is likely irreversible. While the move should improve the group’s profitability in the price sensitive domestic market, where both of its brands have been in the red for some time, the PAL Group will not be able grow as fast as its competitors without a budget brand. As a result the group’s share of the market will continue to slip, which in the long term could also impact profitability. Without a budget brand, it will be difficult for the PAL Group to capture more than 30% of the Philippine domestic market over the medium to long term. While it does not have any full-service competitors on trunk routes, the overwhelming majority of the Philippine market is remarkably price conscious. The country’s domestic LCC penetration rate in 2012 was 80%. This will slip in 2013 due to the reclassification of AirPhil/PAL Express but it will gradually inch back up as other LCCs pursue more rapid expansion than the PAL Group. Abandoning the LCC model at AirPhil may seem on the surface like a smart move given the losses the carrier incurred since the 2010 re-branding and the irrational competition the domestic Philippine market saw in 2012. But consolidation in the country's overcrowded LCC sector was inevitable and San Miguel had the cash to ride out the storm and not waste the hefty three-year investment made by PAL’s previous majority owner into building up a budget brand. PAL will eventually pay the price as the budget end of the market continues to grow rapidly with its arch-rival Cebu Pacific and pan-Asian LCC groups AirAsia and Tiger enjoying the fruits. The fourth part of this series of articles will look at PAL's prospects in the international market. The outlook for PAL’s long-haul operation was recently boosted by a positive ICAO audit, which should open up expansion opportunities in Europe and the US. But within Asia PAL faces intensifying competition on international routes. The first part, published on 19-Mar-2013, analysed the strong position of market leader Cebu Pacific. The second part, published on 2-Apr-2013, analysed the recent tie up between AirAsia Philippines and Zest Air, which along with new Tiger Airways affiliate SEAir are looking to improve their relatively weak positioning in the highly competitive Philippine market.